Reggie White earned the nickname the "Minister of Defense" with a combination of his amazing defense and his strong religious convictions. These attributes made him incredibly popular with fans and one of the more revered players in league history. 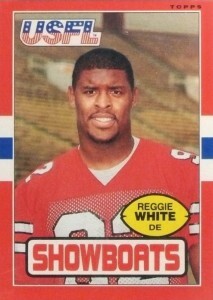 This top list includes the best Reggie White cards across his college, USFL, and NFL playing days. 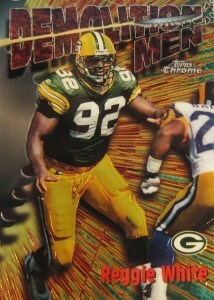 Shop for Professionally Graded Reggie White Cards on eBay. White, a Tennessee native, burst onto the college football scene at the University of Tennessee, becoming an All-American in his senior season. Rather than enter the NFL after being drafted by the Philadelphia Eagles, he decided to stay in Tennessee and joined the Memphis Showboats of the United States Football League. After the USFL dissolved, White became a legendary player with the Eagles, recording an amazing 21 sacks in only 12 games in the 1987 season. His longevity was remarkable as well, twice earning the NFL Defensive Player of the Year more than a decade apart in 1987 and 1998. Although he was already one of the most popular defensive players in the league with the Eagles, he reached another level of stardom when he joined the Green Bay Packers in 1993. He would lead the team to back-to-back Super Bowl appearances and a Super Bowl XXXI championship. In that game, he tied the record for most sacks in a Super Bowl game with three. White finished his career as a 13-time Pro Bowl player and totaled 198 sacks, which was the all-time record at that time. Eventually the record was surpassed by Bruce Smith. However, if Reggie's USFL sacks were included, he would again be the all-time leader. After retiring with the Packers in 1998, White would return to the league in 2000 for one season with the Carolina Panthers before stepping away for good. 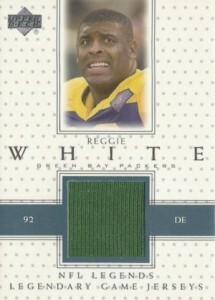 Panthers collectors can find Reggie White cards from his time with the team in 2001 Score and 2001 Playoff Contenders. Although his trading cards are still incredibly popular, White hasn't been included in a licensed football card product since 2012 Panini Prizm. There are some unlicensed relic cards that were included in 2015 Leaf Sportkings for collectors to find. Reggie White's football card portfolio includes appearances in non-NFL sets, limited certified autographs, and very few recently-produced cards which makes his top list a difficult and interesting one to piece together. In building the list, card values were the key component along with the availability of the cards to the collector and the card's design. Although there is a 1986 Eagles Police card, it is the 1987 version that commands more than triple the value because of the limited print run of 10,000 sets. While it might seem logical that Philadelphia police would hand out these cards, it was actually New Jersey police that issued the set. 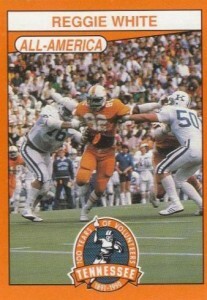 Reggie White is certainly considered the greatest defensive player to ever come out of the University of Tennessee's football program and collectors can find his card in the 1990 set honoring the college's 100th anniversary. On this great action card, White wears the famous white and orange jersey and seems to be tearing through the University of Kentucky offensive line on his way to the ball. While the Collector's Edge series of football cards from the late 1990s might have slipped off the radar for many collectors, they did provide an interesting innovation to the football card world by altering player photographs to feature two players who never played against each other on the same card. 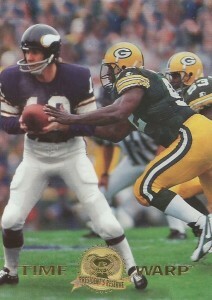 Reggie shares space with legendary Minnesota Vikings quarterback Fran Tarkenton on one of the Time Warp inserts from the 1996 set and it looks like White is about to strip the ball away from Tarkenton. For a four-week period in 1986, Eagles fans could find these game pieces at McDonald's restaurants. 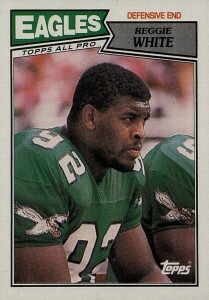 Collectors can still track down four different color variations and this is one of the first Reggie White cards as an Eagle. Obviously, unscratched game pieces with the bottom still attached hold a much higher value than redeemed versions. In a time before serial numbered cards became popular and the norm, collectors looked to Topps Chrome Refractors as a chance to get a limited card. This card from 1997 Topps Chrome was included in the Career Best insert set and was among White's first Refractors available. 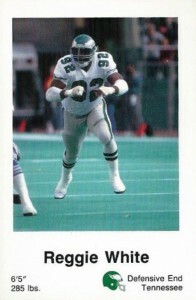 White's second Topps card as an NFL player can be found in 1987 Topps and he earned the All-Pro designation after setting the Eagles single-season record with 18 sacks. 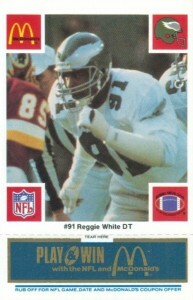 If you rip a wax box of '87 Topps, you might also find a yellow bordered card for Reggie White on the bottom of the box. There were 16 total box bottom cards in four different configurations. 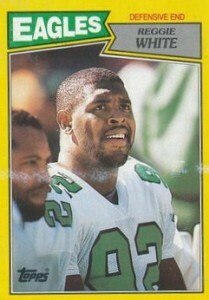 Reggie White certified autographs are few and far between because of his untimely death in 2004. His limited autographs command several hundred dollars at auction and collectors on a budget might be better off to search out one of White's numerous in-person or through-the-mail autographs that often included a Bible verse. Another alternative would be a jersey relic like the one featured below that can be found in 2000 Upper Deck Football. 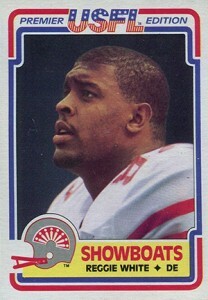 White played two seasons with the USFL's Memphis Showboats until the league collapsed in 1986. Before that, Topps issued two USFL releases in 1984 and 1985 and they configured both as a complete 132-card factory set rather than individual wax packs. 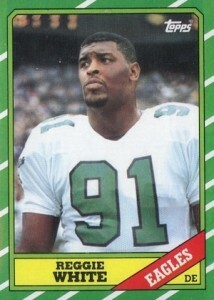 Reggie White made his Topps NFL debut in the 1986 Topps set that is most remembered for its unique green border. The color matches the Eagles jersey colors perfectly and it makes for a beautiful card. The Eagles drafted White with the fourth pick in the 1984 Draft but had to wait until 1985 to get him on the field. Because the USFL played their games in the spring and early summer to not compete directly with the NFL, White was able to play in both leagues during the 1985 season. Casual football card followers might be surprised to learn that the 1984 Topps USFL set has proven to be one of the most valuable Topps football set from the 1980s. This is certainly due to White's first major card coupled with the cardboard debut for two Hall of Fame quarterbacks in Steve Young and Jim Kelly. At auction, highly-graded copies of Reggie's pro debut can top $250. Reggie White Rookie 1984 USFL PSA 9 new hologram Eagles Hall of Famer!